History of Lockwood's Electric Motor Service, INC. In 1932, Mr. George Lockwood started his new business venture in an existing barn that was behind his personal residence located on Nottingham Way in the center of Hamilton Square, NJ. After being in business for one year, he relocated to the buildings, which are presently occupied at 2239 Nottingham Way, Mercerville. The existing Cinder Block building originally housed an Apple Cider Mill, which was then converted into a repair shop for residential and commercial electric motors. General Motors Corporation, in 1938, broke ground for their new Turnstead division in Ewing, NJ. Lockwood’s at that time became an electrical contractor and did many of the original installations for the electrical systems and machinery. During the war years, Lockwood’s also did a lot of Electric Motor Repair at the Fort Dix Military Base. Mr. James E. Dey, Sr., was the Electrical Superintendent at the John A. Roebling Steel facility, joined the Lockwood organization in 1944. With his experience with large apparatus and specialty equipment the company flourished. In 1949, the shop expanded the machine shop and Winding Room, along with a stock room and office building located on Nottingham Way. In 1952, Lockwood’s became a corporation, George R. Lockwood was named President, and James E. Dey Sr. was named Vice President and Shop Superintendent. In the late 40’s, Lockwood’s was very much involved with doing work for the Pennsylvania Railroad as well as U.S. Steel Corporation. Along with this work, the corporation expanded their shop to include the High Bay Assembly area, which is now the old High Bay area, along with the current Winding Room. This completed the expansion of the existing location on Nottingham Way. In the next following years, Mr. James E. Dey Sr. and family purchased the Corporation from Mr. George R. Lockwood. At that time, 1974, the Corporation consisted of seven employees, which has grown to over 30 employees currently, and is still to this day expanding. Along with this purchase, many changes have been implemented to the Corporation, including the demolition of the Storage building, and erecting the existing Fifteen-ton Overhead Crane. This Crane is housed in the new large assembly area. In 1982, another building was erected on the existing site also housing a Fifteen ton overhead crane which services our large Twenty Thousand Pound Dynamic Balancing Machine, Sixty-Six inch swing engine Lathe and Six foot Diameter Coil Winding Machine. Along with this expansion, Lockwood’s began, and is still currently servicing many large Corporations Nationwide, including Dupont, Anheuser Busch, Johnson and Johnson, Kimberly-Clark, Bristol Myers Squibb, Merrill Lynch, and many others. To this day, the corporation currently is still located in its original building on Nottingham Way, in Mercerville, at the intersection of Route 33 West and 295 North. We are still growing, obtaining new business, and plan to continue on an upward expansion of territory for many years to come. We now have expanded our Services to include Technical Service in the field, including Vibration Analysis, Dynamic Balancing, and doing Critical Coupling Alignments. 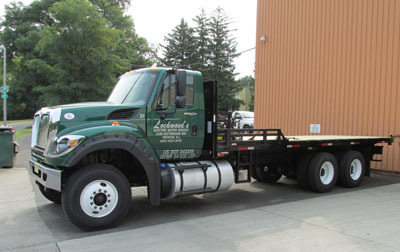 Lockwood’s also has begun to operate its own fleet of Trucks, which includes Tractor-Trailer transportation as well as the ability to load and unload our trucks with our own Forklifts that are transported to the jobsites. The corporation will continue to expand and grow with each new client, company, and opportunity that is presented to them. With over 80 years in business, and experience, Lockwood’s Electric Motor Company is the one to trust for your needs.